Michael Brent is an experienced magazine writer and editor who has written for various publications. He holds a Bachelor of Arts from the University of Winnipeg and has studied journalism at Ryerson University. While running a marathon or long-distance event, your body first will burn through your stored carbohydrates and then burn stored body fat to maintain the energy you'll need. Over time, this will cause your blood sugar levels to drop, so it's important to ensure your blood glucose doesn't fall to a level that will bring about hypoglycemia. There are a variety of different strategies you can use to ensure this doesn't happen so that you can safely, successfully complete your long-distance run. Glycogen stored in your muscles is crucial to your performance when running long distances, according to an article appearing in the March 6, 2011 edition of "The Globe and Mail," and the and the only way you can ensure you have an ample supply of muscle glycogen is to eat carbohydrate-rich foods such as pasta, rice, sweet potatoes, fruit, legumes, low-fat dairy products and whole grain foods. A runner's diet needs to provide enough energy to sustain blood-sugar levels throughout the day, which can only be achieved by eating at least three balanced meals that combine a mix of carbohydrates, fat and protein. If your blood sugar drops to a low enough level and you don't elevate it with some sort of fast-acting carbohydrate such as fruit juice or a sports drink, you may begin to experience symptoms of hypoglycemia. According to the University of Maryland Medical Center, hypoglycemia occurs when your blood sugar drops too low, causing symptoms such as headache, shakiness or trembling, excessive sweating, mental confusion and heart palpitations. During your run, you may be so mentally focused on completing the run and ignoring any pain that you may not notice these symptoms until they become more severe, and more dangerous; excessive sweating, for example, may not be noticeable since you're probably already sweating excessively. For this reason, it's crucial to be nutritionally prepared before you embark on a long-distance run, as a poor diet can cause a marathon runner's blood sugar to plunge to dangerously low levels. If left untreated, severe hypoglycemia can cause such conditions as seizures and comas. A carbohydrate-loading diet, commonly known as carb loading, is a strategy used by long-distance runners to increase the amount of glyogen stored in muscles to improve performance and prevent blood sugar from dropping too low. You should begin your carb-loading diet about a week before the marathon or long-distance running event, at which time you should decrease your carbohydrate consumption by about 50 percent of the normal amount while continuing to train normally. This will deplete your carbohydrate stores so there's room for the loading to come. About three or four days before the event, increase your carb intake to about 70 percent of your daily calories while cutting back on higher-fat foods to compensate for the extra carbohydrates. During this time, you should also scale back on training so you won't use up the energy you're trying to store. When done correctly, carbohydrate loading will ensure you have enough fuel to carry you through the event while maintaining your blood sugar at a safe level. A study published in the January 1988 issue of the medical journal "Diabetes Care" observed the metabolic changes related to blood sugar that took place during a three-hour run, specifically examining how these changes differed in diabetic and non-diabetic runners. 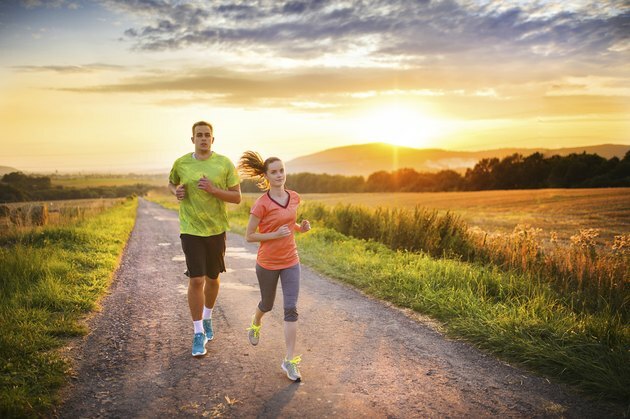 Researchers observed that concentrations of blood glucose decreased significantly in the runners with diabetes but remained constant in the other runners, which were the control group. Post-exercise ketosis — in which the body has run out of muscle glycogen and begins consuming stored body fat for energy — was present in both diabetic and non-diabetic runners, although it was more pronounced in the diabetic runners. This would seem to indicate that anyone with either type-1 or type-2 diabetes should assiduously monitor his blood sugar levels to minimize the risk of exercise-related hypoglycemia. How Many Calories Are Burned During a Marathon? How Does Sugar Affect Running?